By law, Real Estate Agents in Australia must reveal anything that has the potential to impact a buyer or renters perception of a property that they are interested in. This includes the knowledge of any undesirable event that may have taken place at the location. Certain events attached to a property can result in stigmas and undesirable associations or connotations. These can range from untimely deaths, to crimes, to the impact of neighbours and environmental issues. One of the more unique issues that can arise is the speculation of ghosts. Agents are required to reveal any relevant information about a property that may not be visible. This includes the disclosure of the possibility of ghosts and hauntings known or reported to be within the home. State and territory legislation, as well as codes of conduct, emphasise the requirement of agents to act honestly, fairly and reasonably when dealing with any client. Deliberately hiding or misleading information is a breach of conduct. This is not a confirmation of ghost’s being real or a reflection of individual agents’ beliefs, but rather the acceptance and disclosure of a reported potential presence that may stigmatise the property. Particularly if there is any evidence or it is well known by a community, the agent is obliged to disclose the information to prospective buyers or tenants. 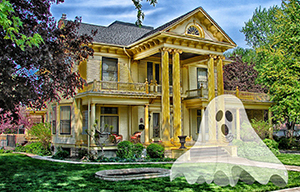 While the majority of people would most likely ignore or laugh off the claims, some individual’s may consider reported hauntings as a deal breaker. Real Estate experts recommend always getting information from agents in writing and ensuring that there is officially nothing more to be disclosed about the property before going ahead with the purchasing process.